Founders Theatre is a significant city asset on the fringe of the central business district. The theatre was closed in February 2016 due to concerns about the safety of the flying system used to hoist scenery and lighting above its stage. A subsequent Detailed Seismic Assessment also revealed the building has a New Build Standard rating of just 15 per cent: a building is deemed to be earthquake prone if it is less than 34 per cent. In June 2016 we asked the community what we should do with Founders Theatre. there is strong support for a specific concert hall development from some sectors of the arts community. 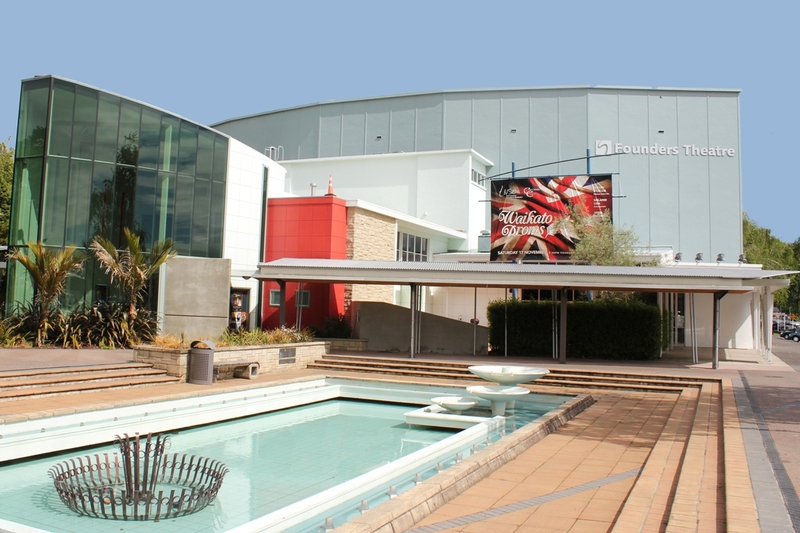 Following the closure of Founders Theatre, Momentum Waikato came forward with a proposal on the design, development and construction of a new theatre for the city and region – the Waikato Regional Theatre. The Council agreed to help fund work on Momentum Waikato’s proposal, and has agreed – in principle – to commit $30 million to the theatre project. Momentum Waikato leads the process on designing and developing the new theatre, has identified a Victoria St location, and reports regularly to the Council with updates. The Council has staff involved in the planning work relating to the proposed new theatre. Should the Waikato Regional Theatre go ahead, we need to decide what to do with Founders. Demolish completely: remove the entire building and return the site to greenspace for an estimated cost of $802,000. This option will create additional greenspace in the West Town Belt and is the most cost effective option. However we will lose a significant civic building and its history. Partiallly demolish and repurpose for other uses: remove the foyer, auditorium, and stage house, but retain the existing dressing room building for re-use, and integrate the building with the surrounding park at an estimated cost of $1,198,000. This option will allow for part of the building to be retained for community use and for the building to be incorporated into the surrounding greenspace. It will provide the opportunity to recognise and commemorate the history of the site and is a cost effective option. Reinstate for community use: undertake earthquake strengthening work and compliance upgrades and cut down the height of the stage house with the rest of the building to be retained in its current state with an estimated cost of up to $12 million. This option retains the history of the building. It would provide additional space for community use but may also result in potential oversupply of community theatre spaces. These costs are significant and currently unbudgeted. The Council wants to get your view on what it should do with Founders - but it’s important to bear in mind no decision will be made until we know the outcome of the Waikato Regional Theatre proposal. - Have Your Say requires you to have cookies enable in your browser. See Cookies police for further details.